At last, summer is in full swing! Lake days, vacations, and day trips with the kids are all now the norm. And the best part is that so many places are now dog friendly so you can bring Fido along. With all of this extra time, activity, and heat we must keep one thing in mind: hydration. This goes for both two and four legged family members. Many people have experienced the effects of dehydration. And your pets are not immune either. It is very important to remember that your dog is like an athlete. Without enough water, they cannot perform their best. Luckily there are several easy ways to ensure your dog stays hydrated. First, let's talk about water sources around your home. Regular water bowls are good, but should be viewed as the minimum requirement for hydration. This is because the water can become stale and warm. Dogs will still drink this water but may not prefer it. Have you ever wondered why your dog drinks out of the toilet? It is because the toilet water is regularly refreshed and cool. And to them this is a better source of water than a stale water bowl. 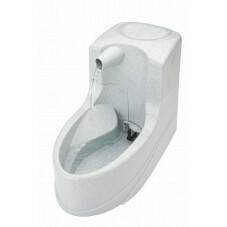 An easy way to offer your dog a top notch water source is to get a filtered water fountain. 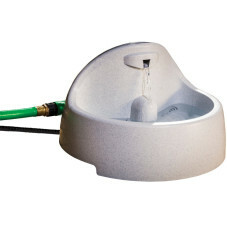 PetSafe Drinkwell fountains are a great choice for this. They are both stylish and effective. And the filter and water flow system keeps the water cool and fresh throughout the day. Plus there are outdoor options available that can connect to a water hose to keep it full at all times. It is also important to remember that if your dog spends a lot of time outside, the heat will cause dehydration quickly. One way to fix this problem is to keep plenty of fresh water and shade available for your dog. 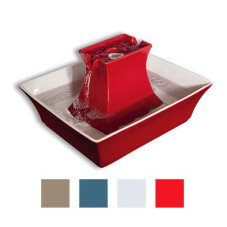 But you can also get creative and use small kiddie pools. This will provide entertainment for your dog and keep him nice and cool as well. Another fun idea is to take treats and toys and freeze them in water. Keep in mind that all of these topics we have discussed will help with some of your dog's bad drinking habits, such as drinking out of toilets or dirty standing water. But you should also understand that many dogs will drink dirty rain or pond water because it is natural for them to do so. So don't be surprised if Fido still drinks out of the river or pond or puddle in your yard. The next topic we should discuss is hydration on the go. Everyone loves brining their dog with them on trips. Whether you are hiking, boating, or just walking downtown we cannot forget to bring water for our dog. From pop up bowls and pet canteens to water bottle attachments, you can find an easy way to bring your dog's water wherever you go. Now I want to add supplements to the conversation. Like athletes, sometimes water is just not enough. If your dog is very active and a true athlete, you will see a great benefit with hydration supplements. Think of this as a sports drink for you dog. This will help keep your athletic dog hydrated and replenished for top performance. Now is the time to get out and enjoy the summer with your four legged friends. Make sure you keep them hydrated and they will always be willing to go on an adventure with you. Have a conversation about the importance of this topic to all your pet parent friends and family. And most importantly, make this summer full of memories with your pets! Black Cat Syndrome: Fact or Myth?